“Corner of Biltmore and Cliffbourne. Cracking the windows is not enough on sunny days! The dog was in there for at least an hour and a half. Thanks to MPD Officer Dunn and the Humane Rescue Alliance. “The dog is out, the Humane Society documented the conditions so the owner can be cited, and the car is being towed. Thanks very much to Officer Dunn of MPD for caring enough to call the right people and see this through. 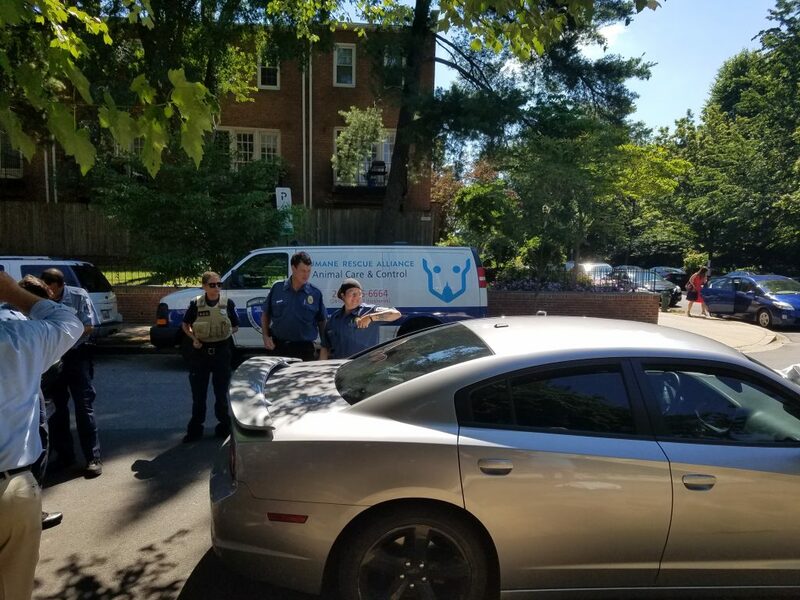 Shame on the first officers on scene who said it would be okay to leave the dog in the car in the sun because the windows were cracked, and who then left. That is not the appropriate response. Cracking the windows does not do enough on any sunny day, much less a scorcher like this one. The interior temp was over 100 degrees, and that is despite our neighbors putting a blanket over the windows to block the sun. “The dog is out of the car and he is ok! Animal control explained they will do a cruelty evaluation for 20 days; if no evidence of cruelty, the owner has 20 days to claim; if not claimed, this gorgeous big dog will be up for adoption (I think at the Humane Rescue Alliance).